ASAP Checks offers a complete range of premium quality Computer Checks for most Accounting Software (e.g. Intuit Quickbooks, MYOB, Peachtree, Microsoft Dynamics) and Personal Finance Software (e.g., Intuit Quicken). Our Computer Checks are compatible with all Ink/Inkjet and Laser Printers, most orders are ready to ship in just one day, and we will beat any price! Our Computer Checks are guaranteed to be compatible with the ones you order from your bank, software company (such as Intuit, Peachtree, and Microsoft) or check printer (such as Intuit, Deluxe, Harland Clarke and Microsoft, or you get a 100% refund. Computer Checks are checks that you print on using accounting software (eg. QuickBooks) or personal finance software (eg. Quicken). From ASAP Checks, these are available in "sheet" format for use in laser printers, ink printers and inkjet printers. Other check printers sell Computer Checks in "continuous" format (the type with pinholes on either side). What are Voucher Computer Checks? Voucher Computer Checks have 1 check on the sheet and 2 vouchers (also called stubs) where payable and payroll details can be printed. The check may be on the top of the page, in the middle or the bottom. The software you use will determine which layout you need to use. What are 3 Per Page Computer Checks? 3 Per Page Computer Checks have 3 checks on each page, and come in 2 sizes. Business 3 per page (also called Standard 3 per page) Computer Checks have 3 full size business checks on each page. Any details about the check must be printed on the memo line. Wallet 3 per page Computer Checks have 3 personal / wallet sized checks on each page, with a small stub on the left where details about the check can be printed. What kinds of printers can I use to print on Computer Checks? Computer Checks that are on sheets can be used on any laser printer and ink/inkjet printer. What is the difference between Computer Checks, Laser Checks and Ink/Inkjet Checks? Computer Checks, Laser Checks and Ink/Inkjet Checks are all referring to exactly the same thing. To the best of our knowledge, with one exception, no one produces checks that are just for laser printers or just for ink/inkjet printers. The exception is that some Computer Checks have a special coating so that laser printer toner will better fuse to the paper; however this type of Computer Check can still be used on ink/inkjet printers. What software do Computer Checks work with? 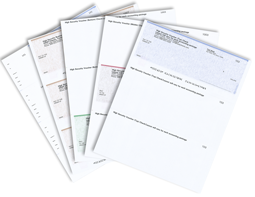 These checks are used with Accounting Software (eg. Accounts Payable, Payroll) such as QuickBooks, and with Personal Finance Software such as Quicken. Does it matter if my Computer Checks are numbered in ascending or descending sequence? Yes ! Some printers need the paper to be inserted face up in the tray, in which case the checks should be numbered in ascending order. For printers that need the paper to be inserted face down, the checks should be numbered in descending order. What kind of security features should I have on my Computer Checks? The quality and affordability of scanners, copiers and printers has made it easier than ever for crooks to counterfeit checks that are not well protected. And without other important security features, a crook can alter checks. To prevent copying/reproduction, your checks should include an area printed using thermochromic (heat activated color change) ink or a hologram, invisible or flourescent fibers, microprinting and a true watermark. To prevent tampering/altering, your checks should include chemical protection and “toner grip” coating if you will be printing them using a laser printer. Do I have to order Computer Checks from my software vendor or my bank? No. For starters, software vendors and banks do not print checks, they simply send the orders to a check printer to fulfill the order. And there is no legal requirement to purchase from these sources. What should I look for when comparing check printers for Computer Checks? Before looking at price, turnaround and customer service, you should be certain that the check printer is capable of and does carefully protect your sensitive bank account information, and that the Computer Checks they offer include extensive security features. Can I also fill in Computer Checks by hand? Sometimes it would be convenient to fill in a check manually by hand without having to order manual checks for this purpose. In some cases you can order Computer Checks with “handwriting lines”. I have ordered from you for other businesses so was pleased that the order was correct and prompt. Also the price is more competitive that banks or Intuit. We have ordered checks from ASAP for several years. The customer service has always been excellent. The checks have been shipped out promptly, are great quality, & the price is very reasonable.